A new Nintendo Switch adapter that’s perfect for Super Smash Bros. Ultimate allows classic, wired GameCube controllers to be used without trailing a wire from the controller to the console. Called the GBros. Wireless Adapter and created by 8BitDo, the Nintendo Switch accessory that mostly cuts the cords on the Nintendo GameCube controllers is now available to pre-order from Amazon for $19.99. Instead of connecting a controller directly to an adapter hanging off the Nintendo Switch, the wireless adapter “functions in concept just like the original Wii Mote,” the Amazon listing explained. By setting up the GBros. Wireless Adapter near the Nintendo Switch and plugging a classic controller from a GameCube, NES, or SNES or other older Nintendo devices into the adapter, the controllers can be used to play games on the Switch. The adapter doesn’t entirely cut the cords between the controllers and the consoles, but it does allow players to sit back and enjoy their games with the classic devices without having to be right next to the console or string a wire across the room. 8BitDo’s specs for the device found through the official site said it functions anywhere between 6-10 meters away from the console, a distance that gives users some room to work with. With controller ports on both sides of the device, it also has four buttons for different options including a built-in “Home” button and one used to take screenshots. Super Smash Bros. Ultimate is the likely the first game that’ll come to Nintendo Switch owners’ minds when thinking of how the adapter could be used given how popular GameCube controllers are with different Smash games. 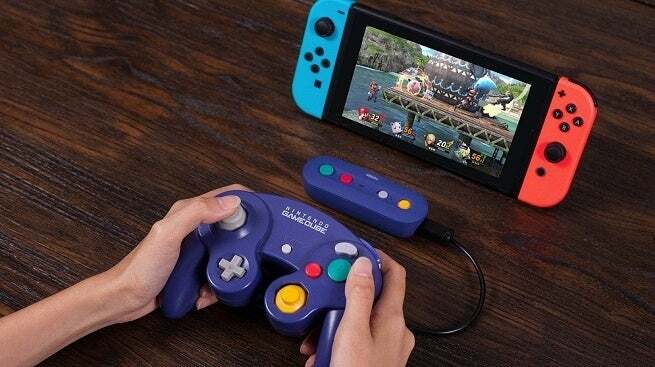 8BitDo itself is pushing it as such with many of the promotional images used on the adapter’s page showing GameCube controllers hooked up to the adapter with images of the new Super Smash Bros. Ultimate game displayed on-screen and the tweet above stating that it was made for the game. The timing of the adapter’s release date makes the purpose clear as well since the device is scheduled to release on December 7th, the same day that Super Smash Bros. Ultimate itself releases. The GBros. Wireless Adapter is now available to pre-order from Amazon and releases on December 7th.